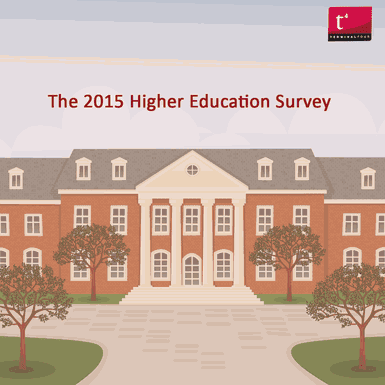 This time last year we launched our inaugural higher education web survey into the world and today we are launching its 2015 counterpart. Last year, when sitting down to think about the types of questions we wanted answers to we all agreed we needed to set about creating a survey that would be beneficial to marketing and IT professionals who work in higher education. The survey was designed to give a snapshot into the global marketing and IT trends occurring within higher education institutions at a particular moment in time. We wanted to see what the common global trends were, who the thought leaders were and where there was room for improvement. We couldn’t have asked for a better turnout (especially for our first try) with 169 higher education institutions taking part and this time around we want to hear from even more of you! The questions are pretty straightforward and the survey only take a few moments to complete so if you work in a web, content, marketing or senior management position in higher education then we would appreciate your participation. If I haven’t managed to convince you to partake thus far, there is also the matter of 5 $/£/€ 100 Amazon vouchers that we are giving away to consider. Go on, you’re worth it.